For a number of years I have been in communication with the writer and journalist Chris Parkinson. During a number of visits to East Timor, Chris began to document the walls which reflected the turbulent times this country has been through. His idea was to turn this into a book, and during our correspondence I did my best to offer support in this area. Finally the Peace of Wall book is printed and I have a copy in my hands. It doesn’t disappoint – with admirable dedication Chris Parkinson has produced an evocative piece of photojournalism – capturing an important moment in East Timor’s history through its walls. His timely photographs uncover the memories of these walls, supported by excellent research and personal anecdotes. This book alerts us to the cultural value of graffiti and street art for public expression, rehabilitation and community building. 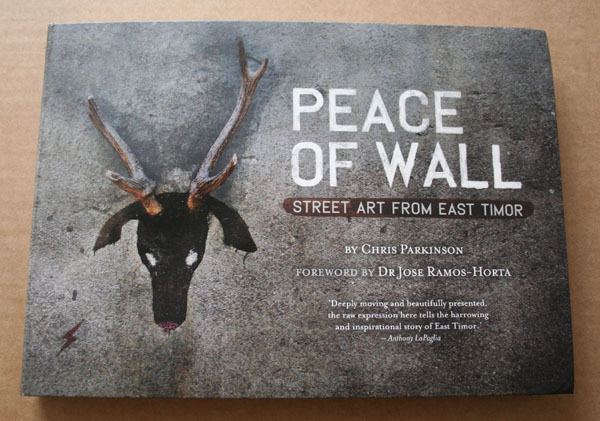 This is not a typical “Graffiti” book – it is more focused toward understanding the community and the way it expresses its concerns and dreams. The president of East Timor was so impressed with the book that he has found funds to have the book translated into either Portuguese (East Timor’s official language) or a native language. How many graffiti books can make the same claim!